Living one’s own life, raising children, exploring one’s gender, or grappling with issues in the workplace, in academic settings, in the family, or just out in the world can create stress, anxiety, and suffering. The psychological services I offer involve both short-term and long-term interventions to “untie the knots” or remove the psychological roadblocks that prevent someone from moving forward in their life or from continuing to grow and develop. Integrating a social systems and psychodynamic approach, I offer both short- and long-term psychotherapy, short-term consultation, and ongoing “on-call” services. When working individually with children, I ask for parents’ participation in parent meetings so that we can collaborate in doing what’s best for their child. The work typically begins with a parent meeting and then three or more initial sessions with the child to determine the best treatment plan. In addressing gender issues in children and adolescents, every effort is made to include all family members in the work, with opportunity for individual sessions for the child, parent consultations (which are often conducted in lieu of seeing the child directly), meetings with siblings, grandparents, and any other significant others engaged in the child’s life. The goal is to sort out any gender conundrums, reduce gender stress, enhance gender resilience, and affirm and/or strengthen parent, school, and community acceptance and support.. In working with families of divorce, I offer individual therapy to children so that they have a “room of their own” to sort out their experience, co-parenting counseling and consultation to parents, and developmental consultations. My individual work with adults typically involves open-ended psychotherapy where it is mutually determined by myself and the person seeking services as to the long-term or short-term nature of the problem and the most advantageous or feasible frequency of meetings. I also offer consultation services, when there is a particular problem of focus, such as a specific concern about one’s child and his or her development. Typically, a specific ongoing appointment time is established and people are asked to give 24 hours notice if they need to cancel an appointment. Less than 24 hours notice results in a charge for the missed session. People have the option of paying at the time of session or receiving a monthly bill at their last session of the month, with payment due by the first week of the following month. 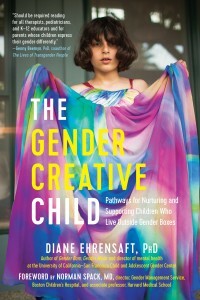 Diane Ehrensaft’s most recent publication is The Gender Creative Child: Pathways for Nurturing and Supporting Chldren who Live outside Gender Boxes, New York: TheExperiment, 2016, with a foreword by Dr. Norman Spack. Go to “Books” tab to find out more information about The Gender Creative Child.